This is a startlingly frank account of a psychiatrist’s and a psychologist’s learnings, milestones and mistakes when working with people with the characteristics of borderline personality disorder (BPD). The book is an examination of the physician and therapist as much as it is of this often ‘alarming and bewildering’ group of people. These references, along with the suggested further reading that follows, provide a body of work that collect in one place our thoughts, ideas and experiences over our professional lives—at least to date! We’ve annotated some of the references that we consider particularly useful in terms of the ideas discussed in this book. Little J, Rouhan J. An organisational and community-based approach to deliberate self harm. Australasian Psychiatry 2009;17: 169–170. Ballarat Health Services, Grampian Psychiatric Services. Caring in a different way: An organisational and community-based approach to deliberate self harm. Ballarat, Australia: Ballarat Health Services; 1999. These are the course notes for a two-day workshop that we ran. Little JD, Bipolar II and the birth of a new physics. Australia & New Zealand Journal of Psychiatry 2013;47: 882. It took 1200 years for Copernicus’s notion that the sun, not Earth, was at the centre of the universe. However, with sincerity, interest in broadening the bipolar spectrum may be premature. Little J, Richardson K. The clinician’s dilemma: Borderline personality disorder or bipolar spectrum disorder? Australasian Psychiatry 2010;18(5): 303–308. Examines subjectivity in the diagnostic process, acknowledging the role of bias and the limitation of the scientific method. A theoretical paper. Akisakal HGS, Djerderedjian AH, Rosenthal RH, Khani MK. Cyclothymic disorder: Bipolar spectrum disorders. Harvard Review Psychiatry 2004;12: 140–145. Toulmin S. Agent and patient in psychiatry. International Journal of Law and Psychiatry 1980;3: 267–268. Surprisingly helpful. Mill JS. Three essays: On liberty, representative government, the subjection of women. Oxford, UK: Oxford University Press; 1975. Little, J. Do I matter? Therapeutic communities. The International Journal of Therapeutic Communities 2014;35(1): 1–4. doi: 10.1108/TC-03-2013-0004. The point is in the title. I often ask the people I work with this question. Watts D, Morgan, G. Malignant alienation. British Journal of Psychiatry 1994;164: 11–15. This paper is a useful reminder of what can happen when people feel they matter to no one. Murphy GE, Guze SP. Setting limits: The management of the manipulative patient. American Journal of Psychotherapy 1960;14: 30–47. Written over 50 years ago and still a classic. Abroms GM Setting limits. Archives of General Psychology 1968;19(1): 113–119. Phillips A. Saying no: Why it’s important for you and your child. London, UK: Faber and Faber; 1999. A great read on an important topic. Well written and sensible. Little J. The therapeutic use of ‘no’. Paper presented at the 13th International Congress on the Disorders of Personality, 16–19 September 2013, Copenhagen, Denmark. This paper provides a useful summary of the sparse literature on this very important topic. McCarthy JJ, Borders OT. Limit setting on drug abuse in methadone maintenance patients. American Journal of Psychiatry 1985;142(12): 1419–1423. This is the reference for the study showing better outcomes for people who were given a clear message. Orentlicher, D. Denying treatment to the non-compliant patient. The Journal of the American Medical Association 1991;265(12): 1579–1582. doi:10.1001/jama.1991. 03460120093043. The original reference on Brenda Payton and the experience of the renal team. Stitzer ML, Petry, N, Silverman K. Contingency management therapies. In Strain EC, Stitzer ML (eds.) The treatment of opioid dependence. Baltimore, MD: The Johns Hopkins University Press; 2006, pp. 151–177. Bowlby J. A secure base: parent–child attachment and healthy human development. London, UK: Routledge; 1988. Ainsworth, MDS, Blehar, MC, Walters, E, Wall, S. Patterns of attachment: A psychological study of the strange situation. Hillsdale, NJ: Lawrence Erlbaum Associates; 1978. Kübler-Ross E. On death and dying. New York: Scribner; 1969. A classic. Axelman M. On holding the situation: Parental affect tolerance, limit setting, and the transition to object usage. Journal of Infant, Child, and Adolescent Psychotherapy 2009;8(2): 96–103. doi: 10.1080/15289160902949769. Bellinson J. You can’t do that—or can you? Historical and clinical perspectives on limit setting in child psychotherapy. Journal of Infant, Child, and Adolescent Psychotherapy 2009;8(2); 87–95. doi: 10.1080/15289160902949678. Casement P. The setting of limits: A belief in growth. Journal of Social Work Practice 1992;6(1): 25–30. doi: 10.1080/02650539208413482. Basescu S. The threat of suicide in psychotherapy. American Journal of Psychotherapy 1965;19: 99–105. Maltsberger JT Calculated risks in the treatment of intractably suicidal patients. Psychiatry: Interpersonal and Biological Processes 1994;57: 199–212. Schwartz DA, Flinn DE, Slawson PF. Treatment of the suicidal character. American Journal of Psychotherapy 1974;28: 197–207. Straker G, Waks B. Limit setting in regard to self-damaging acts: The patient’s perspective. Psychotherapy: Theory, Research, Practice, Training 1997;34(2):192–200. doi: 10.1037/h0087846. Waska R. Barely here to begin with and not-so-goodbyes: Keeping the faith when working with turbulent patients. American Journal of Psychotherapy 2012;66(1): 23–44. Green SA, Goldberg RL, Goldstein DM, Liebenluft E. Limit setting in clinical practice. Washington DC: American Psychiatric Press; 1988. Pam, A. Limit setting: Theory, techniques and risks. American Journal of Psychotherapy 1994;8(3): 432. Little J, Little B. Borderline personality disorder: Exceptions to the concept of responsible and competent. Australasian Psychiatry 2010;18(5): 445–450. Influenced by Dawson and MacMillan’s approach wherein the person with borderline personality disorder is regarded as a responsible and competent adult, we examined whether neurocognitive differences or age constituted exceptions to the rule. We concluded they did not. Dawson D, MacMillan HL. Relationship management of the borderline patient. New York: Brunner/Mazel; 1993. This book is excellent. It is easy to read and paints a philosophy that we believe in, namely that the patient is respected as a competent, responsible adult, and provides really useful responses to awkward questions that you wished you’d thought of. If you’re short of time, just focus on the middle sections, Chapters 5–8. Linehan quoted in Behnke SH, Saks ER. Therapeutic jurisprudence: Informal consent as a clinical indicator for the chronically suicidal patient with borderline personality disorder. Loyola of Los Angeles Law Review 1998;31: 945–982. 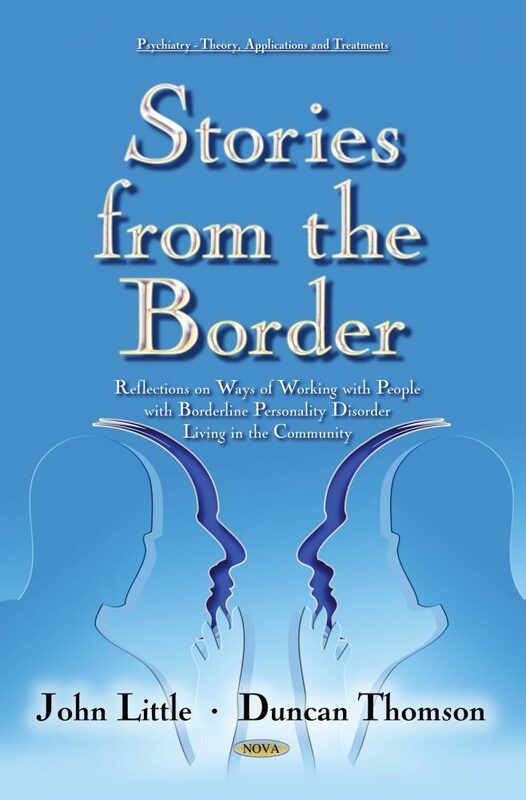 Gutheil, T. Medicolegal pitfalls in the treatment of borderline patients. American Journal of Psychiatry 1985;142(1): 9–14. An excellent paper that should be read by all clinicians concerned about medico-legal aspects of care. Commonwealth of Australia. Review of the law of negligence: Final report (the IPP Report). Canberra, Australia: Commonwealth of Australia; 2002. Kernberg cited in Paris J. Managing suicidal crises in patients with severe personality disorders. In: van Luyn B, Akhtar S, Livesley WJ (eds.) Severe personality disorders. Cambridge, UK: Cambridge University Press; 2007, pp. 109–117. The actual sentence reads: ‘Kernberg (1987) suggests that chronic suicidality requires patience rather than action’ (p. 113). Landsberger HA. Hawthorne revisited. Ithaca, NY: Cornell University; 1958. Kennard D, Haigh R. Therapeutic communities. In: M Gelder (ed.) The new Oxford textbook of psychiatry. Oxford, UK: Oxford University Press, 2007; pp. 142–148. Sharrock J, Rickard, N. Limit setting: A useful strategy in rehabilitation. Australian Journal of Advanced Nursing 2002;19(4), 21–26. Group for the Advancement of Psychiatry. Forced into treatment: The role of coercion in clinical practice (Formulated by the Committee on Government Policy, Report no. 137). Arlington, VA: American Psychiatric Publishing; 1994. Landreth GL. Therapeutic limit setting in the play therapy relationship. Professional Psychology: Research and Practice 2002;33(6): 529–535. doi:10.1037/0735-7028.33.6.529. Siefert CJ (2012). A goal-oriented limited-duration approach for borderline personality disorder during brief inpatient hospitalizations. Psychotherapy: Theory, Research, Practice, Training 2012;49(4): 502–518. doi: 10.1037/a0026128. Goldberg RL. Psychodynamics of limit setting with the borderline patient. The American Journal of Psychoanalysis 1983;43(1): 71–75. doi: 10.1007/BF01253500. Shapiro E. The holding environment and family therapy with acting out adolescents. International Journal of Psychoanalytic Psychiatrists 1982;9: 202–226. Little J, Little M, Little R. Rescuing: A universal phenomenon [in press]. Australasian Psychiatry. We were intrigued by the difficulty people have with respect to allowing their children to grow and assume the responsibilities of adulthood. The literature we reviewed enabled us to understand the genuine difficulties. Palmer, B. Bipolar, borderline or both? Diagnostic/formulation issues in mood and personality disorders. [Video] 2014. Available from https://www.youtube.com/watch? v =NcEAAZi3Qk0 [Accessed 16 August 2014]. Svabado E. Kings and queens of chaos. Psychology Today 2013;46(5): 78. Kendler KS, Myers J, Reichborn-Kjennerud T. Borderline personality disorder traits and their relationship with dimensions of normative personality: A web-based cohort and twin study Acta Psychiatrica Scandanavica 2011;123(5): 349–359. Gunderson, JG, Zanarini MC, Choi-Kain, LW, Mitchell, KS, Lang, KL, Hudson, JI. Family study of borderline personality disorder and its sectors of psychopathology. Archives of General Psychiatry 2011;68(7): 753–762. Not an inviting title but the evidence base for the relatively recent discovery that there is a high heritability associated with borderline personality disorder. Anything of John Gunderson’s work is worth reading. Monterosso J, Royzman EB, Schwartz B. Explaining away responsibility: Effects of scientific explanation on perceived culpability. Ethics and Behavior 2005;15(2):139–158. Those clever psychologists! Astley R. Multiple metaphyseal fractures in small children (metaphyseal fragility of bone). British Journal of Radiology 1953;26(311): 577–583. Little J. Borderline personality disorder, neuroscience and responsibility. Australian & New Zealand Journal of Psychiatry 2014;48: 878. An attempt to summarise thoughts succinctly in relation to responsibility and the emerging biological emphasis appearing in the literature. Little, J. The prescription [in press]. Australasian Psychiatry. An attempt to succinctly summarize the multiple roles embedded within a prescription irrespective of the pharmacology. The letter also invites the clinician to consider any intervention, including hospitalisation and the allocation of case managers, as a prescription, and potentially with side-effects. Gutheil TG. The psychology of psychopharmacology. Bulletin of the Menninger Clinic 1982;46(4): 321–330. Gutheil’s work is always thoughtful. This article is no exception. Stanley B, Siever LJ. The interpersonal dimension of borderline personality disorder: Toward a neuropeptide model. American Journal of Psychiatry 2010;167(1): 24–39. doi:10.1176/appi.ajp.2009.09050744. Current psychotropic medication is modest in its effectiveness at best. Larry Siever has been instrumental in examining in particular the biological correlates of impulsivity and the possible role of the opioids, oxytocin and vasopressin. Irwin S. How to prescribe psychoactive drugs. Bulletin of the Menninger Clinic 1974;38: 1–13. National Health and Medical Research Council. Clinical practice guidelines for the management of borderline personality disorder. Melbourne, Australia: National Health and Medical Research Council, Commonwealth of Australia; 2012. Carter A, Hall WD. The need for more explanatory humility in addiction neurobiology. Addiction (Abingdon, England) 2010;105(5), 790–791, 795–796. doi:10.1111/j.1360-0443.2009.02783.x. Little J, Stevens D. A patient-based voucher system for brief hospitalisation. Australian & New Zealand Journal of Psychiatry 1999;33: 429–432. The model we used to explain the development of this approach was locus of control. It seemed to work. Glannon W. Our brains are not us. Bioethics 2009;23(6), 321–329. doi: 10.1111/j.1467-8519.2009.01727.x. Morse SJ. Criminal responsibility and the disappearing person. Cardozo Law Review 2006;28(6): 2545–2575. Vincent NA. Neuroscience and Legal Responsibility. Oxford, UK: Oxford University Press; 2013. Rothschild B. The body remembers: The psychophysiology of trauma and trauma treatment. New York: WW Norton; 2007.
	van der Hart O, Nijenhuis ERS, Steele, K. The haunted self: Structural dissociation and the treatment of chronic traumatization (Norton Series on Interpersonal Neurobiology). New York, WW Norton; 2006. Flewett T. Clinical risk management: An introductory text for mental health professionals. Chatswood, Australia: Elsevier Australia; 2010. Tartaglia M, Little J. Clockwatching and hate [in press]. Australasian Psychiatry. Despite Michael entering practice and me retiring, the themes remain and are usefully thought and talked about rather than ignored. Gabbard GO, Wilkinson SM. Management of countertransference with borderline patients. Gabbard GO: American Psychiatric Press; 1994. Maltsberger JT, Buie DH. Countertransference: Hate in the treatment of suicidal patients. Archives General Psychiatry 1974;30(5): 625–633. Roberts VZ. The self-assigned impossible task. In: Obholzer A, Roberts VZ (eds.) The unconscious at work: Individual and organisational stress in the human services. London, UK: Routledge; 1994, pp.110–120. Brown G, Kainth K, Matheson C, Osborne J, Trenkle A, Adlam J. An hospitable engagement? Open-door psychotherapy with the socially excluded. Psychodynamic Practice 2011;17(3): 307–324. Lewis G, Appelby L. British Journal of Psychiatry 1988;153: 44–49. Wallace ER. Psychiatry and its nosology: In: Sadler JZ, Wiggins OP, Schwartz MA (eds.) Philosophical perspectives on psychiatric diagnostic classification. Baltimore, MD: The Johns Hopkins University Press, 1994; pp. 295–314.